Creamy, salty, tangy and rich – this pizza is totally crave worthy! 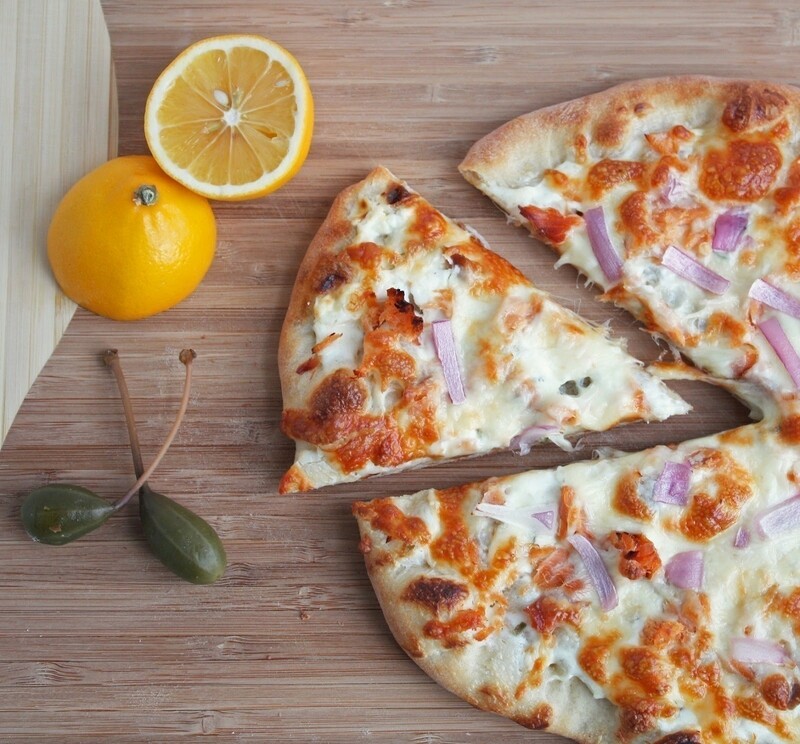 Based on the flavors of the ever popular NYC classic, bagels and lox, this pizza starts with a dill flavored cream cheese and is then topped with smoked salmon, red onions, capers and mozzarella cheese. A squeeze of lemon as it comes out of the oven adds a refreshing tang. You'll be addicted to this one once you try it! Roll or press out your dough into about a 10 to 12 inch pie. Combine the cream cheese, dill and chopped capers (use the tiny ones, not the big caper berries that I used in the photos – it’s easier!) in a small bowl, mixing well. Spread the cream cheese onto the dough – this is your “sauce.” Sprinkle the salmon evenly over the top. Top with mozzerella & parmesan cheeses, followed by the red onion. Bake for 8 – 10 minutes on a preheated stone at 500 degrees. In the absence of a pizza stone you could bake it on a sheet pan but it may need a couple of extra minutes. Remove from oven, cut into slices, and squeeze the half lemon over it just before serving.